Ray recently had his annual medical, and all the testing proved very good as he was declared to be in “excellent health”! 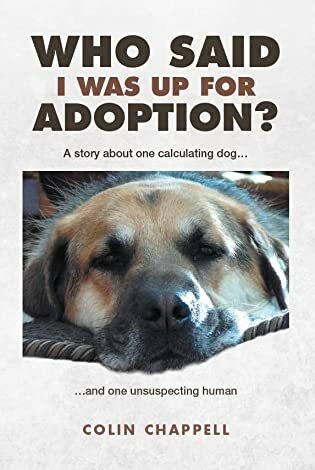 It will be very difficult (probably impossible) to erase the experience of working with Ray during his heartworm treatment program (full story is in his book “Who Said I was up for Adoption?” – click book cover over in right side column for more information). Below is a copy of a March 2015 Post about Ray’s heartworm experience stressing the importance of preventative treatment. In March of last year, we were advised that Ray’s final blood test confirmed his treatment for heartworm (the previous summer) had been successful, which meant that there was no evidence of any microscopic “babes” in his system. That whole episode in Ray’s life was a very emotional roller coaster for us, and it was exacerbated by the apparent disbelief with which other dog owners (and even vet technicians) responded to it. It was not that they were unsympathetic, but more just totally surprised because, after all, “heartworm is a rarity around here.” A few phone calls to other vets in our general area provided information to the contrary and in fact one office had recorded 30 cases to date for that season! Some basic research made it clear that, while regular monitoring for statistical purposes was non-existent, incidents of heartworm in Southern Ontario had increased by 60% between 2002 and 2010. This seemed to be generally attributed to a couple of circumstances, the main one being the “It’s not likely to happen to my pet” thinking. The other factor was the influx of rescued dogs from the southern U.S. and other locations where mosquitoes thrived all year. As a basic “primer” in heartworm, it must be understood that because it is spread by mosquitoes, you only need one animal (domestic or wild) to have it in order for the condition to be spread. Domestic dogs and cats, together with a range of wild animals, are all targets for a heartworm implant by a passing mosquito so having a potential donor in any area that supports mosquitoes is quite likely. The mosquito finds a lovely warm body for the microscopic heartworm babe to grow, which it does by living off its unknowing host. Over a relatively short period of time, the heartworm population grows with adults reaching the size of spaghetti strings, and are forced to spread out to other parts of the host. The end result is a slow and painful death if left untreated. I felt that pet owners in our general area needed a “wake up call” on the issue. While mosquitoes around here are only active for around 6 months of the year, it still presents a significant risk and I consequently created a short video (starring the beloved Ray) which was adopted by our vet for heartworm prevention promotional purposes. For those of you who are not familiar with the condition, I hope that the video is informative. The reference to NOAH in the video is the North Oakville Animal Hospital. All the staff there have done a wonderful job of taking care of our Ray from before, during, and after the heartworm episode. Pawsome video and sobering facts in your post! I remember when I thought heartworm was rare, mostly because I didn’t know any dogs who suffered from it. But then I started volunteering at an open admission shelter, and I found out just how common and dangerous it is! Yes it surprises a lot of people who will, hopefully, take the necessary actions to protect their dogs. I live with canine epilepsy & drugs used in HWT are not safe for me to take. We live 3+ hrs N of Toronto & plenty of mosquitoes during our short season. As you pointed out it is getting riskier to not use a preventative action especially due to all the dogs that visit from USA & those rescued from outside of Canada. We’ll be discussing this with our wagnificent Vet. Wow! Three hours north of us really does put you into mozzy territory! I have the best vet possible. Hope you do to! Woof! Ray. That’s the way to go! We are special and deserve nothing but the best! BOL! BOL! Ray. I am glad Ray is doing well. A clean bill of health is always good. Lena is not doing well at all. We had a scare this weekend, and she has a follow-up check on Thursday (11th). Keep her in your thoughts, please. Sorry to hear that Rae (and Lena). Will be thinking of you both tomorrow. Check up was as good as could be expected for an 18 year old feline. She has a new medicine in powder form to put in her food, and we increased her hyperthyroid medicine. She is,at least, grousing again at what displeases her. My friends refer to her as “Rae’s Talking Cat.” I don’t have the heart to tell them she’s complaining. My cleaning friend is here this morning, and Lena just chewed her out for moving her food and water bowl. Excellent timing for this post, April is National Heartworm Awareness Month here. Prevention is paramount, the cure may not be successful. Ray is fortunate to be a success story, thanks to your love and the great work by NOAH. Wonderful video, Ray shines throughout and the important message is clearly given. Thank-you for sharing! This can really happen quickly and most of all unnoticed. Just a stupid mosquito with such a dramatic effect. Absolutely Erika. Dramatic … and deadly. A great video, informative, and poignant, especially with the pictures of handsome Ray! The old saying, ” An ounce of prevention is worth a pound of cure” came ot my mind while watching it. Cheers to all of you for helping to spread an important message! Great video Colin. Puts the message across excellently. Me too. He’s a handsome chap. Zack is still about, though their GSD Vogue is not responding well to socialising so I don’t see them together very often. We have to remember that Ray took about 3 years before he really turned around re socializing. That has been my major negative with Ray ………. other people’s dogs. It really takes a lot of the fun out of walking him when you have to second guess what an approaching dog is likely to do. So many of them do show clear aggression in advance, but others are more subtle … and the owner thinks it’s hilarious that their miniature “whatever” just tries to nip Ray. It was more frustrating because was Ray was originally nervous about other dogs and, just as we started making progress with him, we met a delinquent dog and owner which set Ray’s training right back. People!!!! Sounds like bad, nasty stuff. Nice video. Yup. Being eaten alive is bad however you look at it. It is way more prevalent in the southern US but as you described, like Zika, it only takes one mosquito to bite a transplanted animal to spread. Great news for Ray.